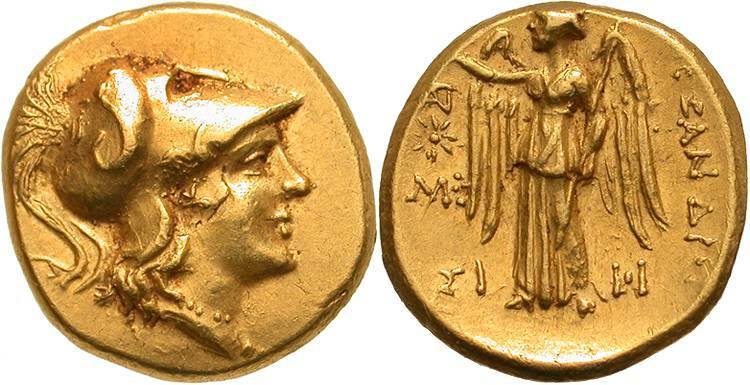 "Alexander the Great 336-323 BC. 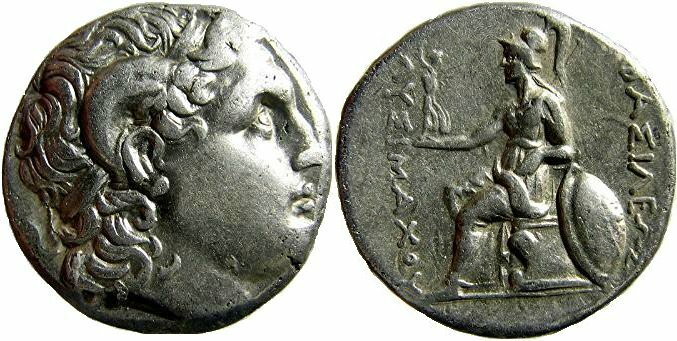 Silver tetradrachm, 27 mm. Obverse: Head of Alexander draped in a lionskin, facing right. Reverse: ALEXANDROU. Zeus enthroned holding eagle and scepter, L and torch in the field, caduceus below. Ca. 328 - 320 BC. " "Alexander the Great 336-323 BC. Gold stater, 19 mm. Obverse: Helmeted head of Athena right; serpent on helmet. Reverse: ALEXANDROU. Nike standing left, monograms and Macedonian star in the field. Sinope mint, ca. 330-317 BC." "KINGDOM of THRACE: LYSIMACHOS (323 - 281 BC) AR Tetradrachm. Head of the defied Alexander right with horn of Ammon/ BASILEOS (in the right field) LYSIMAXOY (in the left field). Athena enthroned left, holding Nike in her extended right hand, and resting left elbow on shield leaned against throne, transverse spear resting against her right side. Faint monogram near left limb of Athena.17.15 gm. Lysimachos, the son of Agathokles, was from Pella in Macedonia. 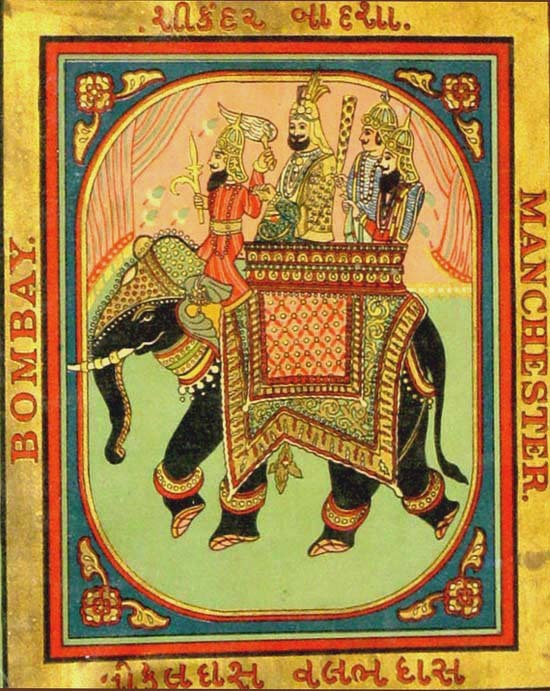 During Alexander's Persian campaigns he was one of his immediate bodyguards and distinguished himself in India." 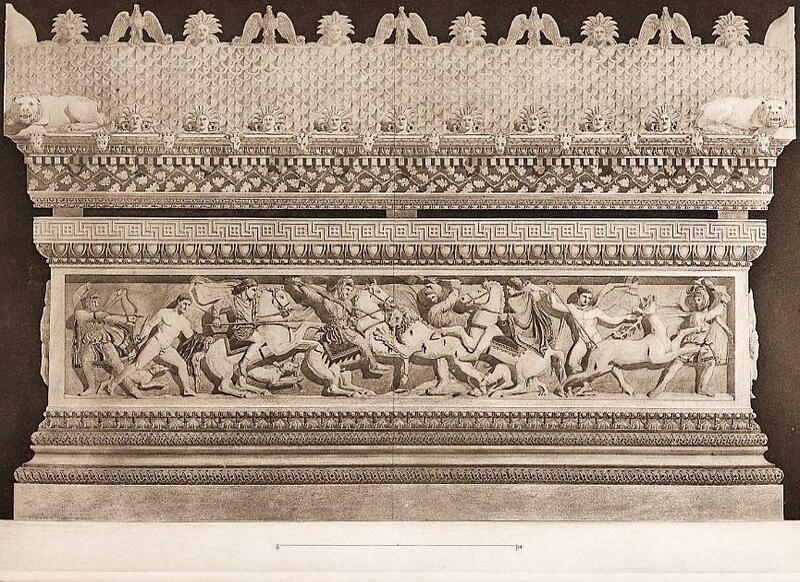 "Under the direction of Prof. d'Espouy, the graduates of the famous Paris school of art, the Ecole des Beaux-Arts, measured, rendered and shaded the views of the famous monuments of classic Greece. These drawing were then reproduced by a 19th C. process called heliogravure." "Woodcut leaf from "Cosmographia" (1544) by Sebastian Münster. French edition; Basel printing house of Sebastian Heinrich-Petri 1552. Book V, pages 1329/30. This leaf from the early French edition of Cosmographia is devoted conquest of India by Alexander the Great. It describes the greatest of Alexander's battles in India against Porus, one of the most powerful Indian leaders - the rajah of the lands between the Jhelum and the Chenab rivers in the Punjab. The battle took place in July 326 B.C.E. at the river Hydaspes. After facing the Indians for days across an unfordable river, Alexander, by using diversionary tactics, managed to cross the stream above their camp. 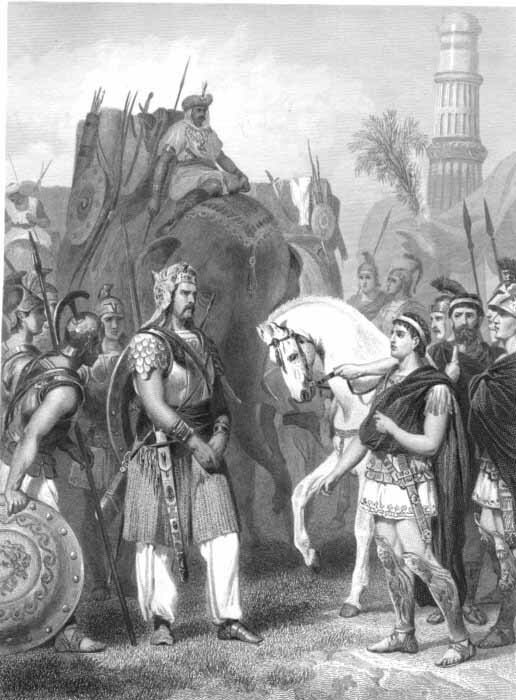 More troublesome to Alexander than the numerical superiority of Porus' 34,000-man army were the 200 elephants that threatened the effectiveness of the Macedonian cavalry. During the battle, Alexander overwhelmed Porus' left wing, forcing it back upon the elephants, which panicked and plunged riderless into the Indian ranks. The Macedonian phalanx then routed the enemy. Alexander captured Porus and, like the other local rulers he had defeated, allowed him to continue to govern his territory. 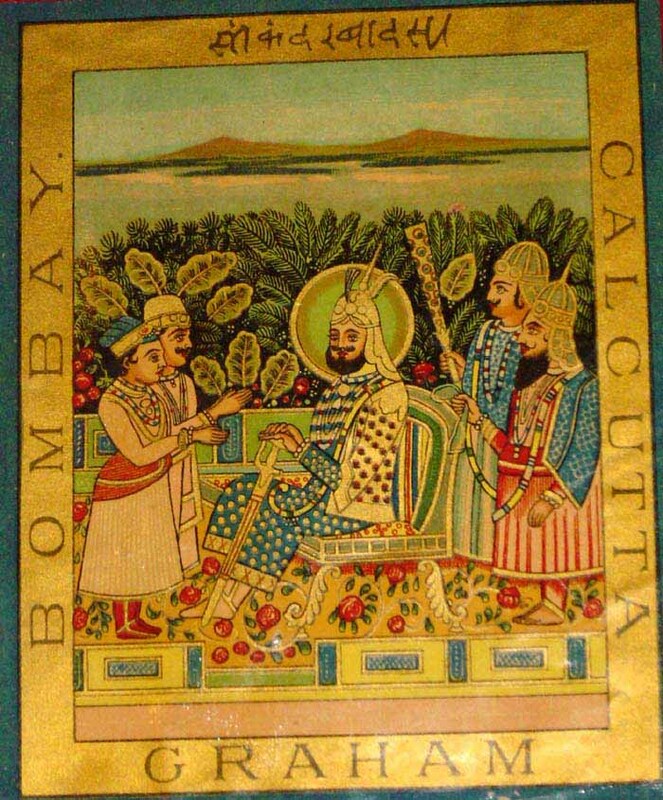 Alexander even subdued an independent province and granted it to Porus as a gift. 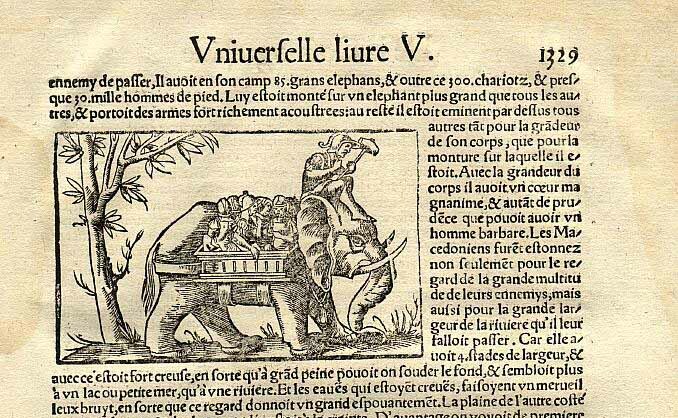 The leaf contains one excellent woodcut picture (3" x 4") of a military unit consisting of an elephant carrying a group of soldiers."